I took an eclectic art class in junior high school in which we learned lots of art forms, including calligraphy and string art, so string art makes me very nostalgic. 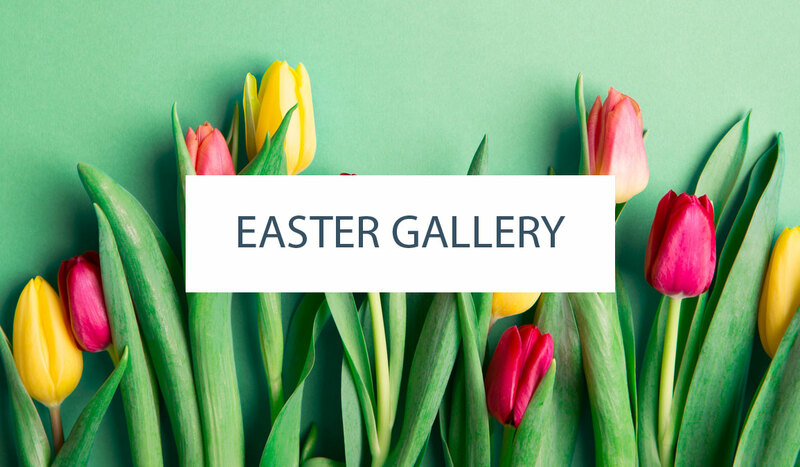 I love the reinvented string art that we’re seeing today, less hippie-arts-and-crafts (the kind I learned) and more refined with lots of geometric shapes and trendy color palettes. 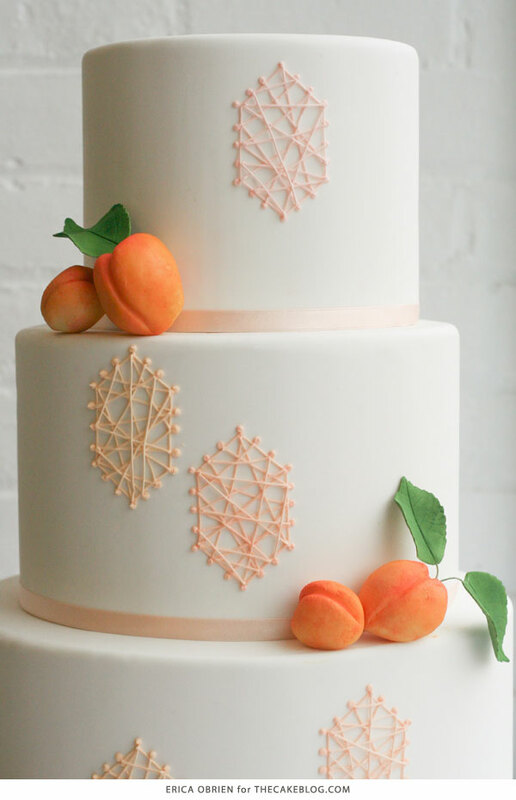 Today’s cake was inspired by string art and pastel peach. 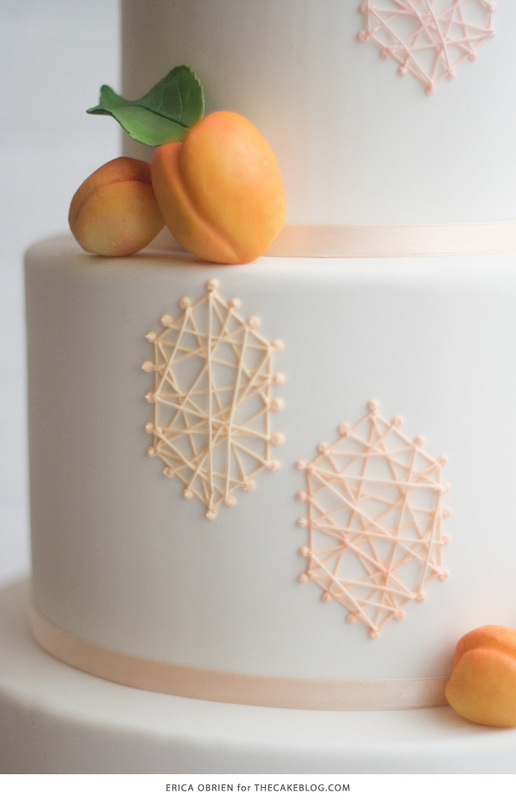 In keeping with the contemporary look of the string art, we wanted to give the cake more modern proportions. We selected 6”, 8”, and 10” rounds, each 5” tall, covered in white fondant . 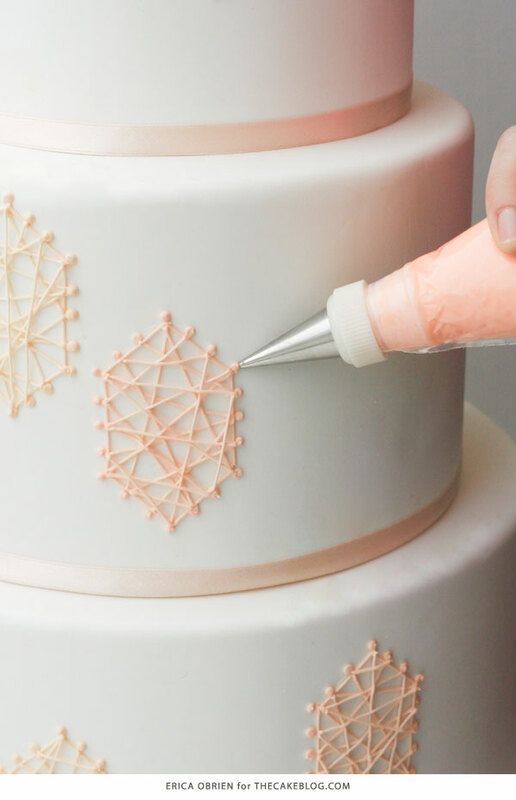 The initial plan was to create the string art pieces on parchment paper, as we thought it would be easier to execute them on a flat surface, let them dry, and then transfer them to the cake. We made a hexagon-shaped template, printed it out, taped it to the table, and placed the parchment paper on top. We used a round tip 3 to recreate the nail heads out of royal icing and then randomly connected them with round tip 1 royal icing “strings”. 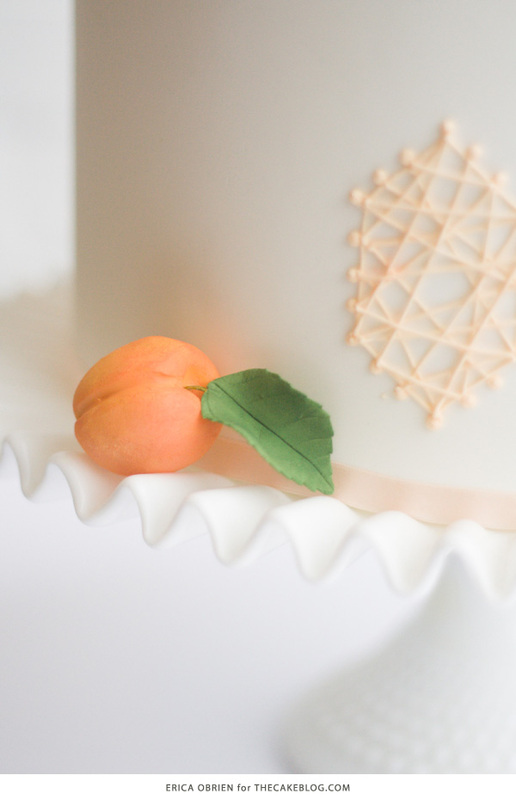 Removing them from the parchment paper proved impossible—they just kept breaking—so we had to do the shapes directly on the cake, which luckily ended up being no more difficult than piping them on the table. 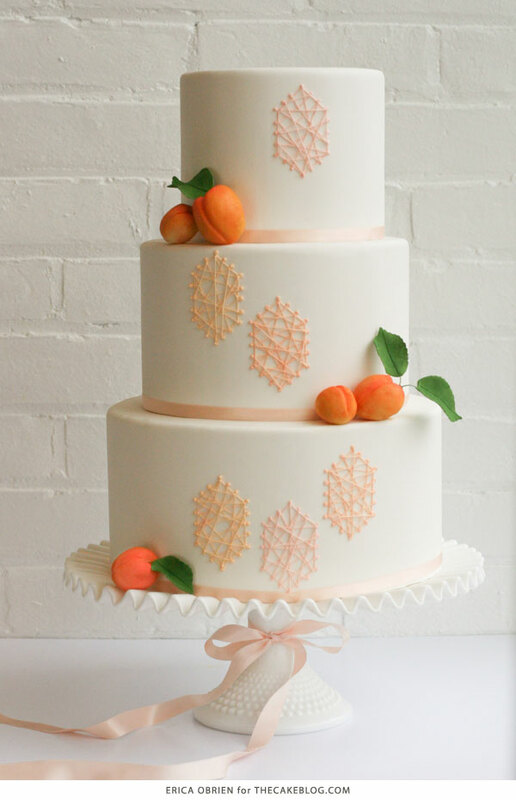 The peach and apricot pastel hues we selected for the string art just sing of spring to me, and we really wanted this cake to celebrate the season. 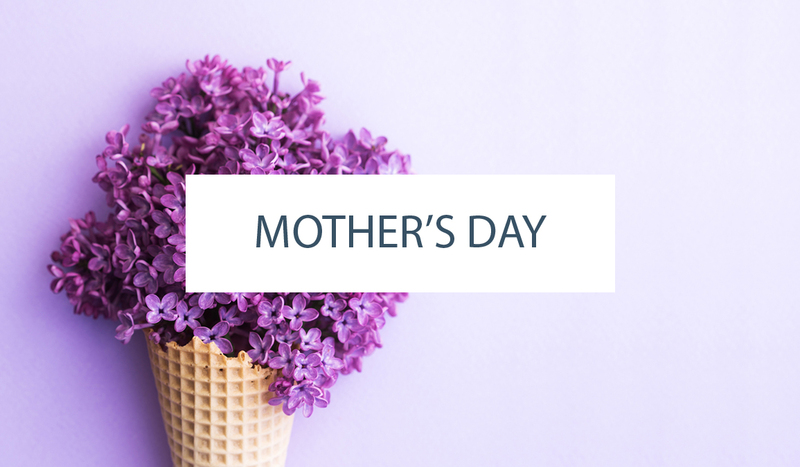 It’s been an impossibly long winter here in the north east, and we’re ready to welcome spring with open arms. 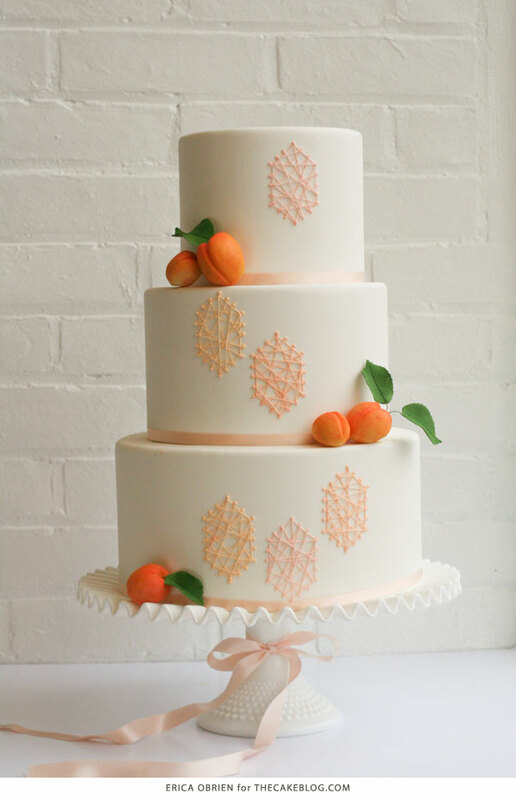 We also wanted to make the cake a bit romantic and organic, so we rendered a literal interpretation of the apricot color palette by making apricots out of modeling chocolate , a medium that is relatively new to me, and shading them with petal dust. 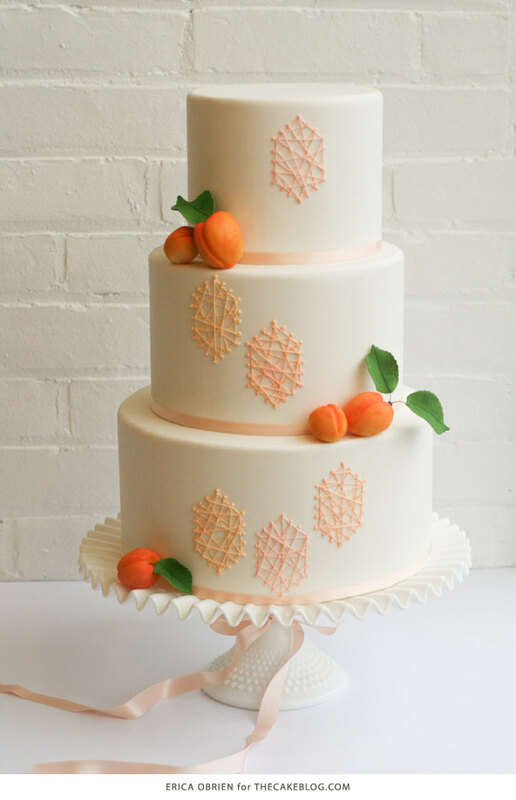 In the end, I was happy with the balance of playfulness and pretty in this cake. As an added bonus, I’m pretty sure it would make my 7th grade art teacher quite proud.